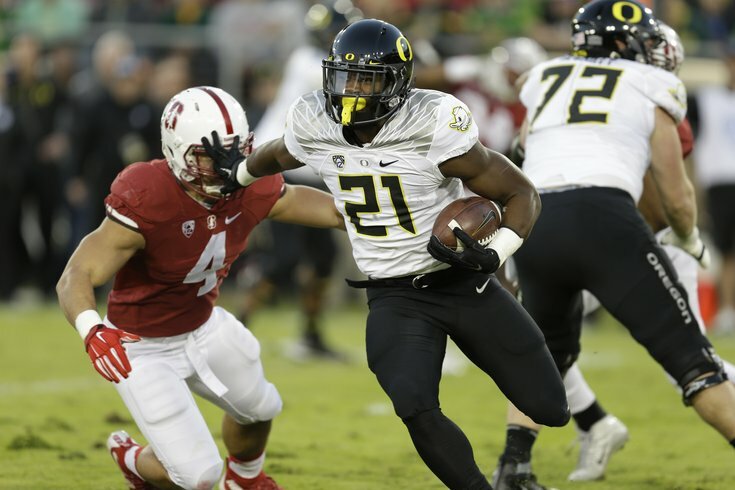 Oregon's Royce Freeman could make sense for the Eagles, assuming Chip Kelly doesn't grab him first. Last week, the college football season kicked off with a number of appealing games. This week it's cupcake city. As long as you're taking in some of the action, here are some players who could make some sense for the Eagles in the 2017 NFL Draft. Dorian Johnson, OG, Pittsburgh (6'5, 300): Penn State at Pittsburgh, 12:00 p.m.
Johnson is a high energy offensive guard (I don't think I've ever typed that before) with a mean streak and good athleticism. That fits some of the things Doug Pederson is looking for in his offensive linemen. "Guys that are athletic who can get out on the perimeter and run, aggressive up front, have a little, as they say, 'piss and vinegar' in their neck are guys that you look for," Pederson explained way back in January. Johnson does a good job with his initial punch, and he's effective as a pulling guard as well as getting to the second level. He has extremely active hands and feet, he never stops looking to hit someone, and he'll play through the whistle. On the downside, Johnson is a bit undersized at 300 pounds, and can be pushed back into the pocket in the passing game. Deatrich Wise, Jr., DE, Arkansas (6'5, 280): Arkansas at (15) TCU, 7:00 p.m. Wise has similar size to some other former Jim Schwartz favorite defensive ends such as Kyle Vanden Bosch (6'4, 278), Kevin Carter (6'5, 305), and Mario Williams (6'5, 300). Like Vanden Bosch, Wise has -- wait for it -- a great motor. My apologies for that. Cameron Sutton, CB, Tennessee (5'11, 185): Virginia Tech at (17) Tennessee, 8:00 p.m.
Sutton is a highly athletic corner who does a good job of getting his hands on the football. As a freshman in 2013, he had seven pass breakups, followed by 13 as a sophomore. As a junior in 2015, Sutton's numbers dropped off because opposing offenses stopped throwing at him, but he still ended up with six pass breakups and a pick, while being charged with just two TDs allowed on the season. Sutton doubles as an outstanding punt returner, leading the NCAA with a whopping 18.7 yards per punt return on 25 attempts in 2015, including two scores. Sutton fits a need both at corner as well as at punt returner, where the Eagles will eventually have to replace Darren Sproles. Jalen Hurd, RB, Tennessee (6'4, 240): Virginia Tech at (17) Tennessee, 8:00 p.m.
Hurd is probably the biggest back in a draft class that is full of big backs. However, unlike some of the other bigger backs in this class, Hurd is very good receiver out of the backfield, which should appeal to the Eagles. Over the last two seasons, Hurd has accumulated 57 receptions. On the downside, Hurd has averaged just 4.7 yards per carry over his college career, when the top backs typically over over 6 YPC. Royce Freeman, RB, Oregon (5'11, 230): Virginia at (24) Oregon, 10:30 p.m.
Like a lot of other running backs in this loaded class, Freeman is a big back at 230 pounds who moves faster than you would expect.